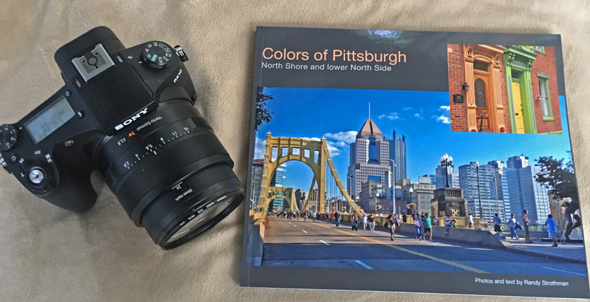 In early March I decided to create my first photo book, Colors of Pittsburgh: North Shore and Lower North Side. Here’s a preview of the 106 page book featuring 191 photos. It’s intended as tribute to Pittsburgh and the historic community that I moved to in 1997. Oh yes, it certainly reflects my passion for colors and photography. This one-of-a-kind coffee table book is not really a comprehensive tour guide, since some wonderful local attractions are not included here. It’s rather a gallery of high quality, colorful images I’ve gathered over 4-5 years to belie Pittsburgh’s historic Smoky City image and to spotlight the rich tapestry and history of the neighborhoods. Colors Of Pittsburgh: North Shore and Lower North Side unfolds as a journey up from the Allegheny River on the North Shore, first into the park and then exploring the lower Northside neighborhoods. Minimal text establishes the context for each of the chapters as well as some historic and other interesting insights into the communities. Here’s the cover. UPDATE on 8/11/16: A nice article in the Northside Chronicle features the book and the background and motivation for it. Thanks Chronicle! This series of 18 thumbnail full-page spreads demonstrates the wide variety of images, plus the sequence of the chapters and the scope of content for Colors. Thanks to Joe Renkley for the use of his photo above right. As part of the creative process, I shared earlier drafts of the book with a variety of people for feedback. Thanks to those that offered insights and encouragement and helped me to refine the book. These early “reviewers” were always enthusiastic about the book and sometimes offered glowing reviews! One of the more flattering ones came from the photo editor for the Pittsburgh Tribune Review. Another said it will add $10k to the value of her house! Yes, it is a marketing tool too! Get your Colors Of Pittsburgh book now. September 2016 UPDATE: The third ‘Colors Of’ book is now published, Colors of Nature: Nature and Man Embracing Nature. Plus you can preview and order the second Colors book—Colors of Pittsburgh: Downtown and The Strip District. Thanks Randy! It’s been fun and a great learning experience.